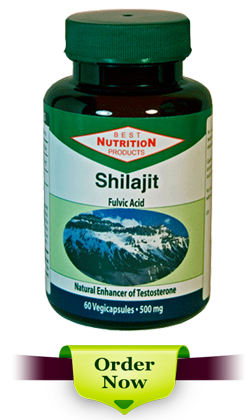 Shilajit is the most important drug of Ayurvedic and folk-medicine systems. In the raw form it is a bituminous substance, which is a compact mass of vegetable organic matter composed of dark red gummy matrix. It is bitter in taste, and its smell resembles cow’s stale urine. The botanical name of Shilajit is asphaltum (mineral pitch). In the Ayurvedic texts it is called as Silajatu or Shilajatu, but is commonly known as Shilajit. .Its Sanskrit meaning is “conqueror of mountains and destroyer of weakness.” Several other terms like Dhaturas, Dhatusara, Shiladhatu, etc. also have been used for it in ancient medical texts like Sushruta Samhita, Charak Samhita, Rasarangini, etc. The term dhatu, which was used as synonyms of Shilajit like Dhahurasa, Dhahusara etc., was simply to emphasize its potentialities as rasayana, which increases the activities of the saptadhatus of the body. Shilajit usually collected over the ground or is found flowing out from between fissures in the rocks in summer months due to strong heat of the sun. In India, it is found in the romantic surroundings of the Himalayas: from Arunachal Pradesh in the east to Kashmir in the west. It is collected in small quantities from steep rock faces at altitudes between 1000 and 5000 m. Shilajit samples from different region of the world have different physiological properties.